I’m still wading through the Yahoo documents released last week. But there is a lesson in them that — given the debate over USA Freedom Act — deserves immediate attention: mission creep. At least in this case, the actual implementation of the Protect America Act appears to have quickly and secretly outstripped the public understanding surrounding of the scope of the law. In response to an order from Reggie Walton to provide precise details about what the government was asking for provide hints of this, the FBI and Yahoo submitted a series of declarations. 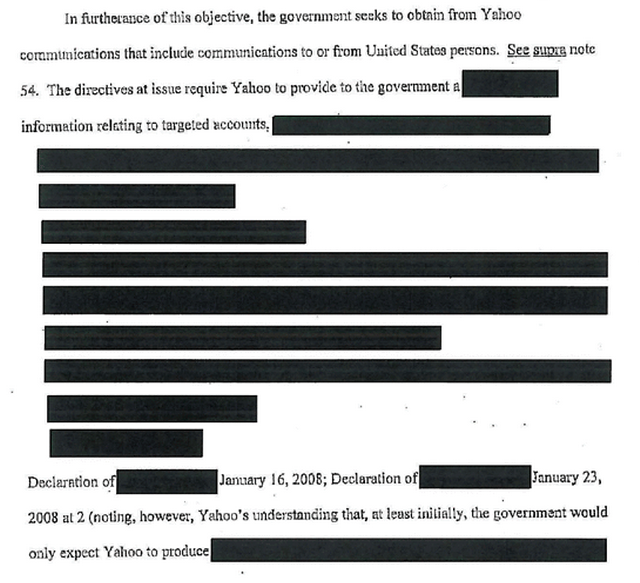 In January 2008, an FBI engineer submitted a declaration detailing what the government demanded (though it is almost entirely redacted). In response, Yahoo’s VP and Associate General Counsel submitted a declaration covering his (or her) involvement; he was the only one who attended all the meetings with the government. Interestingly the first meeting was in August, but before the law was passed. That’s interesting because it was slammed through in a rush on August 4, 2007, meaning, Yahoo must have first met with the government about a bill making dramatic demands on it just days before it passed. The AGC ends his declaration by laying out what data had been discussed while he was involved, but then saying the discussions about a particular issue had not ended when he exited the discussions, so he could not agree with or disagree with some part of the FBI declaration. In a declaration dated the next day, the Manager of Yahoo’s Legal Compliance team (the declaration describes that he or she had the lead on FISA response) submitted her declaration. It says she will be listing the kinds of data Yahoo provides to the government. But before she can do that, she has to lay out that Yahoo offers email and IMs, information services (like Yahoo finance), cloud storage, as well as facilitating all that with communications between the various components. That suggests the government was — already — asking for more than just emails and IMs and, possibly, data storage contents (which would be unsurprising). This seems to be the stuff the AGC couldn’t speak to. The final FISCR opinion listed 9 things the government had demanded, as compared to the one-line long description that Yahoo originally believed — and had been told — it would have to turn over. I followed the PAA debate closely (though not as closely as I’ve followed the USAF debate — I learned you have to watch these things like a hawk!). And I understood the chief goal of the bill was to access the email of the largest free providers, Yahoo, Microsoft, and Google, which all happened to be in the US. I wouldn’t have imagined that the government would also be obtaining the info services habits of targets, though now that idea also seems obvious. And that appears to have happened in less than a year. It just appears that once the government got what they needed, they then started looking around for other ways they could use their new toy. And so kept grabbing more data. This is among the concerns I have about the ambiguous language in USA Freedom Act’s “connection chaining” language — that once they get to the telecoms without a limit to stick to call chaining (they must return a CDR at each stage, but the bill doesn’t say how they get there), they’ll just grab what they can get. There’s an eerie consistency with the behavior of unsavory regimes in the past. Push the envelope; see what the reaction is. Over time, what previously might have drawn scrutiny and widespread objection, becomes acceptable. The inevitable result–in an environment in which the apparatus sells the public an illusory perfect security on the back of “we have to have everything”–is a shift in legal/constitutional fundamentals. Hats off to Yahoo for resisting. Isn’t there always ‘mission creep’ when the MIC gets involved?